It is clear from an essay Vaughan Williams wrote in 1944, “Film Music,” that he greatly enjoyed writing for the genre. The score for Scott of the Antarctic, composed in 1947–48, so engaged the composer that he wrote some of the music well in advance of the actual scenes being shot. The film was first shown in London on 29 November 1948; the soundtrack was a recording of the Philharmonia Orchestra, conducted by Ernest Irving. The ensuing Sinfonia Antartica was composed between 1949–52, and is dedicated to Ernest Irving, conductor of the film score. The premiere at the Free Trade Hall in Manchester featured Margaret Ritchie (soprano) and the women of the Hallé Choir, in addition to the Hallé Orchestra. The first performance in London occurred a week later on 21 January, again with Margaret Ritchie as soprano soloist, at a Royal Philharmonic concert at the Royal Festival Hall. Music that accompanies bleak images of ice, of glaciers, and the sea in the film, appears in the first and last movements of the symphony, and is built upon the same motive previously mentioned in regards to Vaughan Williams’s earlier works. 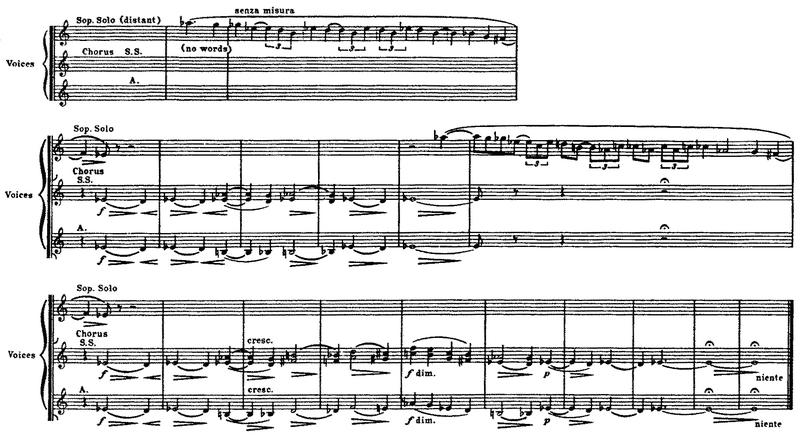 The vocalization in the first movement of Antartica also has a melodic content and contour very similar to the end of Maurya’s elegy in Riders to the Sea. As in the ending of that opera, a solo soprano voice sings a descending figure accompanied by interspersed rocking undulations from the women’s choir singing the Ravel-like motive also found in Vaughan Williams’s earlier works. Another representative example, and one that again shows the two themes juxtaposed against one another, comes from further in the same movement. therefore we have no cause for complaint. The similarity between the outer movements is readily apparent through a comparison of the above examples with one from the last movement. The ending of Sinfonia Antartica is similar to that of Riders to the Sea. Both pieces end with solo wordless soprano with melodic material comprised of the same motive first found in the third of the Five Mystical Songs, and also the Ravel-like theme used to represent the sea. Far more characteristic from the formal point of view . . . are the very free, rhapsodic melodies which may be found in nearly all of the larger works—vocal and instrumental. They are frequently marked “senza misura” and where possible are written without bar lines. Almost completely devoid of harmonic background and of rhythmic regularity or metrical symmetry, they are held together and given coherence by means of a pedal sustained below or above the melody or though some recurring note or figure to which the melody frequently returns. The significance of this type of melody is emphasized not only by the frequency of its use but also by its invariable appearance in prominent places. Although written in 1941, Kimmel’s notion is equally applicable to Vaughan Williams’s Sinfonia Antartica. In addition, his comments in the second quoted paragraph are equally applicable to works by other composers that include dramatic vocalization such as Debussy’s “Sirènes,” the third movement of Roussel’s Évocations, and the “Lamentations de Guilboa” from Honegger’s Le Roi David. 1 Ralph Vaughan Williams, “Film Music,” RCM Magazine 40 (1944): 5–9; reprinted as “Composing for the Films” in National Music and Other Essays, 162. 2 Ursula Vaughan Williams, liner notes to Sinfonia Antartica, by Ralph Vaughan Williams, RCA Victor 09026-61195-2, 4. 4 Ralph Vaughan Williams, Sinfonia Antartica (London: Oxford University Press, 1953), [ii]. 5 Colin Mason, “Vaughan Williams’s ‘Sinfonia Antartica,’” Musical Times 94 (1953): 128. 6 Michael Kennedy, “The Unknown Vaughan Williams,” Proceedings of the Royal Musical Association 99 (1972–73): 40. 8 Ralph Vaughan Williams, Sinfonia Antartica, 10. 10 Colin Mason, “Vaughan Williams’s ‘Sinfonia Antartica,’” 128. 11 Ralph Vaughan Williams, Sinfonia Antartica, [i]. 13 Colin Mason, “Vaughan Williams’s ‘Sinfonia Antartica,’” 128. 14 Ralph Vaughan Williams, Sinfonia Antartica, 144–45. 15 William Kimmel, “Vaughan Williams’s Melodic Style,” Musical Quarterly 27 (1941): 495–96.